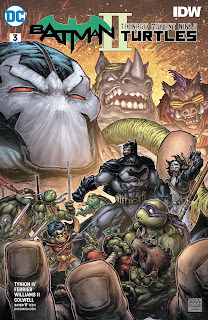 These are two of my favorite properties since childhood (Batman and TMNT) and I loved the first series by Tynion a lot. Admittedly there are obvious similarities between the two groups of characters but they really have no business being together in the same world, yet for some reason it all just worked, and this sequel so far has been no different. Right now Batman and Splinter are trying to determine exactly how to handle an attack at Bane but will they be too late by the time their meticulously laid plans come to action? Lets find out. The issue starts off with a majority of the 'good guys' hanging at the sewer, while Batman, Splinter, and Leonardo do some recon to prepare for their group attack on Bane, who's hiding at Baxter Stockman's Lab, waiting for his fix. Killing time, playing video games, leads to a disagreement between Damien and Raphael. Batman and crew underestimate the situation, as Batman suggests its best to let Bane hit peek withdrawal symptoms before attacking, not aware Baxter is well ahead of schedule with his mixture of Venom. Donnie is still dealing with his personal crisis wondering how he can help the team after his colossal screw up lead to Bane and his current rein of terror. Meanwhile Raph and Damien's disagreement has lead to an hour long training session which is basically a draw until it goes completely out of hand with the two leveling each other with punches and insults. Batman and Splinter storm in breaking it up telling everyone to get ready they're moving on Bane. Very next page opens up the conflict with the crew dropping in on Baxter but quickly realizing they are in over their heads. Donnie discovers the giant batch combining Mutagen and Venom into a deadly concoction of evil which leads to all hell breaking lose. 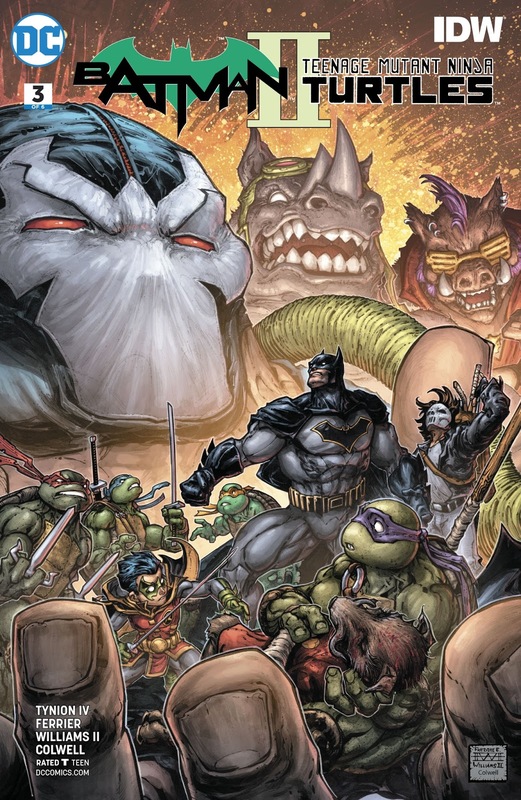 Baxter gets turned into Fly Baxter in all the ruckus from his own working and the issue concludes with pretty much everyone all venom-ed out Bebop, Rocksteady, the Foot Clan, all under Bane command surrounding our heroes who to put it lightly look like they'll be a combination of Turtle and Bat Soup. Overall, this issue really ampped up our upcoming conflicts stakes. This one lacked a bit of the fun the first two issues hit on a little bit more and focused more on the story at hand but it was necessary to move the mini series forward and we should be in for a well paced finally. Ill be back for sure for the second half of the mini and continue to suggest it to anyone who was a fan of the first series, or even Batman or the TMNT to throw a little easy going action in your pull list. . I personally love Freddie Williams art and it looks strong here again. However the fact most of the issue takes place over several indoor location the backgrounds arent as full and notable as previous issue but all the characters including the new venom-ed out villians continute to look amazing. Issue three of the hit sequel mini-series doesnt necessarily slow the action down any but is a little more heavily focused on plot really setting the stage for a huge coming conflict. Freddie Williams comes through in a huge way with some interesting venom influenced TMNT character designs fans need to see. The last three issues should be a blast.